RMK will release its 2009 Christmas palette on 6 November in Japan. 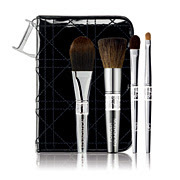 It is a 2-layered crystal-studded compact that includes a face powder, 4 eye colors, 2 cheek colors, Gloss Lips EX12 (mini size), powder brush, eyeshadow brush, eyeshadow tip applicator and cheek brush plus a mini bag. It will retail for 9975yen, which means it could retail for upwards of S$150 in Singapore given the current exchange rate. 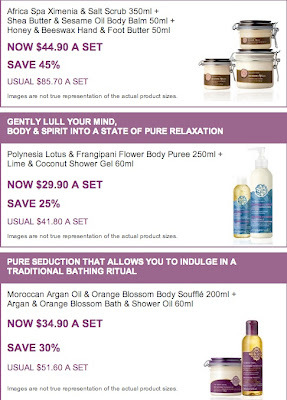 Just received the latest email from The Body Shop on their launch of the Spa Wisdom range and list of promotional bundles for 1-18 October. 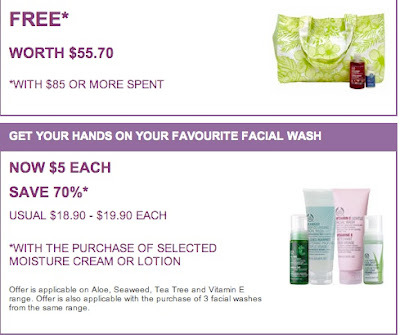 Members are entitled to an additional 10% off the Spa Wisdom bundles. I'd definitely be checking out the Moroccan Argan Oil & Orange Blossom range! A reader just left a comment informing that Yves St Laurent beauty will be pulling out of Singapore by 26 October. It is sad to see another prestige brand decide that our small island country is just not worth their time although admittedly, it is a very tough market environment even at the best of times. YSL, which is famous for their Touche Eclat highlighter, has counters at Tangs Orchard and Robinsons Raffles City. 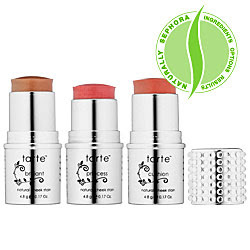 Their Rouge Volupte lipsticks have also gotten massive raves on other beauty blogs. So if you have any favourites from them, do stock up before they disappear. 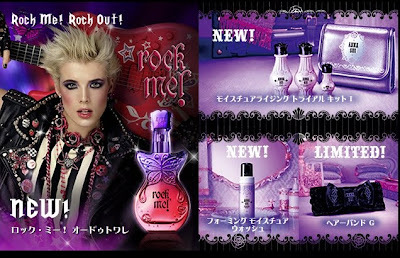 The Anna Sui website has been updated with the second part of the fall collection, comprising a Moisturising Trial Kit, Foaming Moisture Wash, a limited edition Hair Band G and the new Rock Me eau de toilette which is fronted by Agyness Deyn looking like a female Billy Idol. The promo video clip for Rock Me. 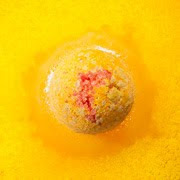 Voce's website has listed the upcoming new/limited edition items for Lush Japan that has sparked off several crazy lemmings for me. The theme for this holiday collection is Endless Fairy Tale. I don't know which of these items are exclusive to Japan but everything just looks so darn cute! 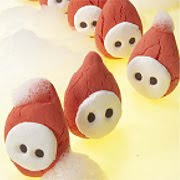 Japan has its own Lush manufacturing facility, unlike most other countries which get their stocks from the UK. The product names are mostly in Japanese, so the translations below are entirely unofficial and just my own guesses. These are launching in October in Japan so I expect they will be similarly available in other countries in October. 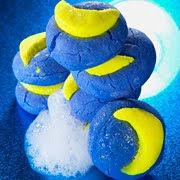 Check out pics from Lush Japan's 10th anniversary event on these Japanese blogs here and here! 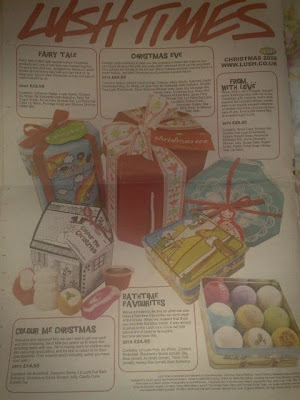 Found this pic of a page from the UK Lush Times on the Lush forums, looks like the items above are not exclusive to Japan! The Chanel Noirs Obscurs collection kept calling me back to the counter until eventually I caved in and bought the Rouge Allure #147 Maniac lipstick (S$44) during the recent Isetan Private Sale. I thought that it could be the perfect dark lip base for combining with various lipglosses. When faced with a range of lip colors, my eye is invariably drawn towards the darker plummy shades. My first makeup purchase was 12 years ago at a MAC counter in Montreal where I got MAC Underworld lipstick as the MA had the most gorgeously gothic blackened blood red lips. Unfortunately, I was never able to replicate that MA's look with Underworld! Maniac looks like a blackened burgundy in the tube. Applied on its own, it is not that flattering on my MAC NC20 skintone as it looks like a flat purplish burgundy. But you can easily change the shade by layering a lipgloss shade on top to make it lighter, more red/pink-toned, more shimmery etc. 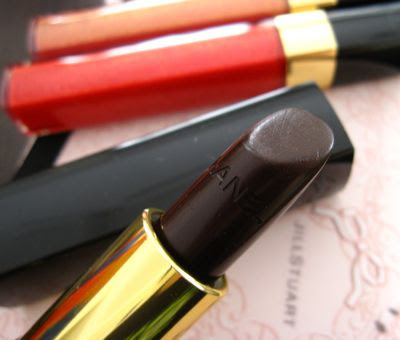 You can see very accurate swatches of the three Rouge Allure lipsticks in the Noirs Obscurs collection on Blogdorf Goodman. 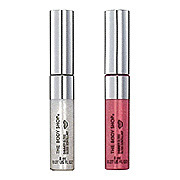 It is intensely pigmented and goes on with a creamy matte finish that is not drying. 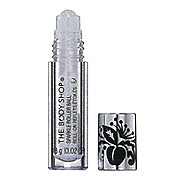 The lipstick feels very luxurious and has a very faint berry scent that is hardly noticeable. Since there was a rebate for purchase of $100, I topped up my purchase with two Glossimers, #134 Jupiter and #128 Meteore (S$38 each). 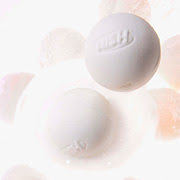 These are intensely jampacked with shimmer and looked absolutely dazzlingly under the counter lights. 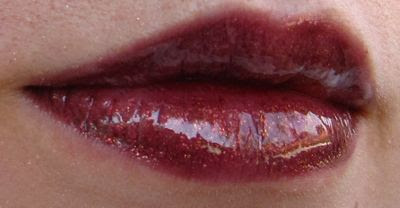 While I liked the texture and shades, I didn't like the glitter bits that were left on my lips after I wiped off the lipgloss during a meal. It took several more hard wipes to get the glitter bits off. 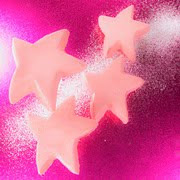 Jupiter (below) is a bright cherry red with pink shimmer while Meteore is a rosey pink. 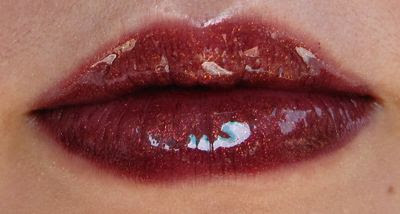 Here's what Maniac looked like on my lips with Meteore layered over it. 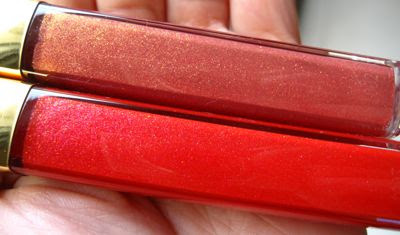 As you can see, Meteore brightens Maniac up, takes away the dark purple tone and gives it more of a reddish berry tone. 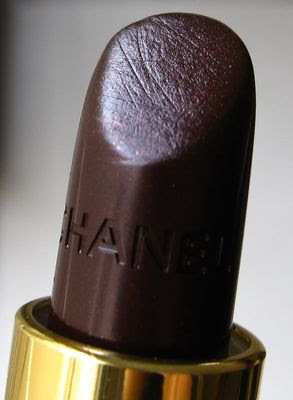 It's a perfect shade for the holiday season, and is much more flattering than Maniac on its own! 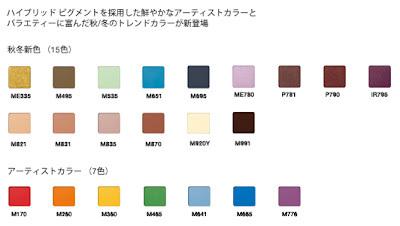 Shu Uemura will add another 22 eyeshadows to its already impressive line-up on 1 October in Japan. The 22 shades comprise 7 Artist Colors and 15 fall/winter shades. 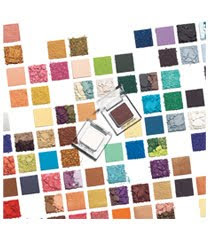 With this collection, there will be 91 shades of Pressed Eyeshadow N and 7 Artist Colors. I recall that there used to be 108 shades of Pressed Eyeshadow N, so this probably means that some shades have been discontinued but I'm not sure which ones. You can check out the new line-up here. The Ipsa holiday collection comprises only skincare and bodycare. 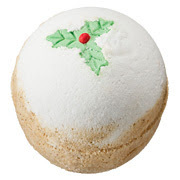 The Holiday Kit 2009 (5250yen) contains a raspberry-scented Body Scrub N 200g, Body Serum N 200ml and After Bath Camisole made of chiffon. The Winter Metabolizer Kit includes a Metabolizer 125ml, trial-sized Metabolizer (25ml), Cleansing Foam 25g, Artisan & Artist cosmetic pouch. The price of the Metabolizer kit varies according to the type of Metabolizer chosen. Due out on 27 November in Japan. 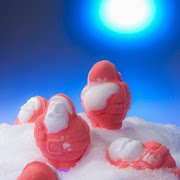 Suqqu will release its snow-themed holiday coffrets on 6 November in Japan. Christmas Makeup Kit A (8400yen) includes Blend Eyeshadow EX06 Maiyuki, Eye Lucent EX03 Yukigasumi and a pouch while Makeup Kit B (7350yen) includes Gloss & Lip Color Palette EX02 Yukiiro, Nail Color EX25 Yukidama and a pouch. 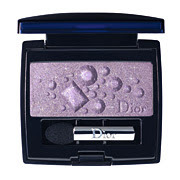 Dior will release its annual holiday makeup palette on 30 October in Japan. 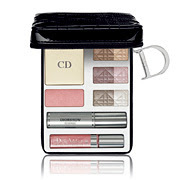 This palette (10500yen) includes Dior Skin Face Powder #30, Dior Blush #943, Cinq Couleurs Iridescent in 6 shades, Mini Diorshow Iconic Mascara #90, Mini Addict Ultra Gloss Reflect #257. Also out on 30 October are this Eye Palette (6825yen) and Brush Set (7875yen), which includes liquid foundation brush, powder foundation brush, eyeshadow and lip brush in mini sizes. The Cristal Boreale makeup collection will debut on 6 November. 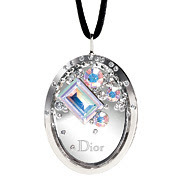 The star item is the Cristal Boreal Gloss Pendant (9975yen). It looks like the US is getting only the Gloss Pendant in only one shade, Pink Cyrstal, but Japan will be getting it in 2 shades. Each compact is covered with 52 Swarovski crystals and contains a lipgloss. 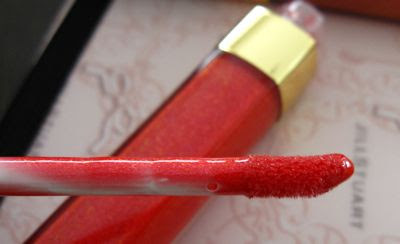 For the other items in the collection, please check out this post on Temptalia.com. The two quints look very attractive! Looks like Lavshuca is giving Majolica Majorca a run for its money with these princessy Custom Selective Eyes (12 duos) which will debut in Japan on 1 November. The slide-out drawer design is reminiscent of Majolica's Shadow Customize singles, which sadly have been greatly reduced in recent years. 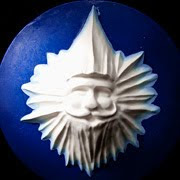 (At its height, Majolica offered 32 eyeshadow singles, but this has been reduced to a measly 12, although they currently offer many more quads.) The duos are supposedly designed to meet consumers' requests for light/dark shade combos, sparkle and color. The design is cute, but I don't have high hopes for the actual shades as Lavshuca has gone the safe and boring route in its recent releases, i.e. lots of muted pastels, beiges and browns. The collection also includes Jewel Lips N (Shiny) (12 shades and Jewel Lips N (Color) (10 shades). 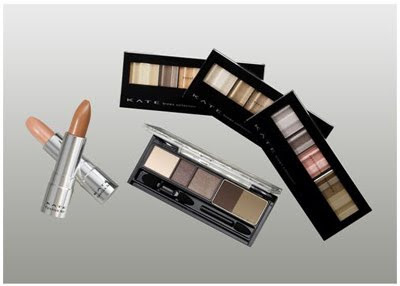 Kate will release a Brown Collection on 1 November in Japan. Kate has had great success this year with the Diamond Cut Eyes palettes (which sold 1.1 million units in just 5 months) and Reflect Mirror Eyes palettes (which sold 600,000 units in just 3 weeks when they were released in August). The Brown collection is built around the beige/brown shades that are favoured by most ladies and is likely to be a big hit with the Japanese "office lady" (aka "OL") crowd. 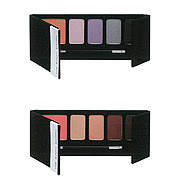 The four palettes (1680yen) each include three eyeshadows and two eyebrow powders. This is the first time Kate is including eyebrow powders in its palettes, which will make them even more convenient but for me, it's difficult to get excited about such bland neutrals. The collection also includes Nudist Designing Lip (4 shades, 1050yen) which are formulated with jojoba oil, almond oil and olive oil. The ladies at Tarte have outdone themselves again with this year's holiday sets. Their blockbuster all-in-one palette is back with 32 new eyeshadows (16 matte and 16 shimmery shades), double the number in the past two years' palettes. 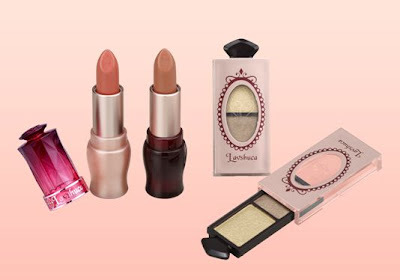 The Treasure Chest (US$52) also includes 6 new lipglosses, the best-selling Park Ave Princess mineral powder bronzer, a new shimmering highlighter, and four new powder blushes. 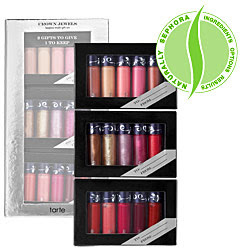 Another bonus is that the palette is made without any parabens, petro-chemicals, phthalates, sulfates, GMOs or triclosans. 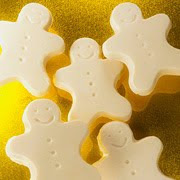 It is also free of preservatives, gluten, talc, glycols, MEA/DEA/TEA, and formaldehyde donors. However, the preservative-free claim makes me wonder how long this palette will last. 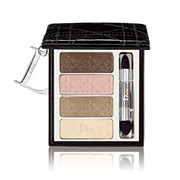 I have been very happy with the holiday palettes from the past two years so I'm looking forward to getting this as well. The Three Carats Mini Cheekstain Set (US$25) contains three brand new shades: Brilliant (shimmering champagne), Princess (shimmering rose), and Cushion (shimmering deep apricot). Sounds delectable but these have not worked that well for me (especially in Singapore's hot and humid weather) so I'll probably be passing on these. During my recent house moving, I decided to throw out most of my Tarte cheek stains as they were quite a few years old and leaking/sweating all over the place. The Crown Jewels set (US$39) of 15 mini lipglosses looks tempting but it works out to be about S$60 not including tax, which is still somewhat pricey. Time to arrange a CP for the Treasure Chest! 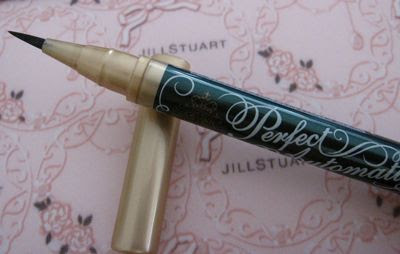 Majolica Majorca's new Perfect Automatic Liner is the 3rd generation of these liquid brush eyeliners. These new liners are formulated with a inky black base to which various color pearl pigments are added to create the individual shades. 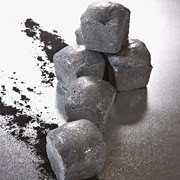 And indeed, GR604 Emerald Black applies as a intensely blackened emerald shade in just a few quick strokes. 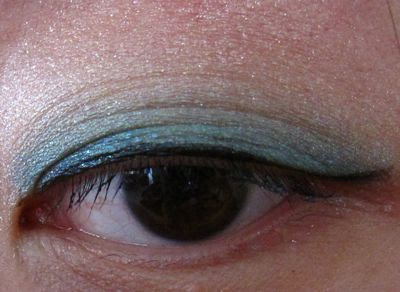 However, being a watery liquid, the application process is trickier compared to a soft gel eyeliner, which does not dry as quickly. The twist/click dispensing mechanism of the Perfect Automatic Liner means that the amount of product in the brush tip is also a bit unpredictable. If there is too much product dispensed, you risk glooping it all over your lashline or ending up with a much thicker line than intended. The trick is to go slow and dispense one click at a time, then add more if necessary. It does take some time to perfect getting a straight line without any bumpy edges. In that respect, I still prefer gel eyeliners as they are much easier to control and blend/smudge compared to a liquid liner, where the mistakes tend to be more obvious. 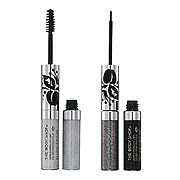 The eyeliner is waterproof and lasts quite well over several hours of wear. I haven't tried the previous versions before so I can't say how the Perfect Liner compares to its predecessors. It has received fairly good reviews on Cosme.net, with an average rating of 4.4 stars out of 7 stars. Overall, I still prefer gel eyeliners (such as those by Maquillage and Coffret D'Or) but the Perfect Automatic Eyeliner is a good and more affordable alternative, if you can get the hang of how to apply it. When using it for the first time, do flex the bristles to separate them before clicking the end to dispense the liquid, otherwise the bristles stick together in a stiff bunch. 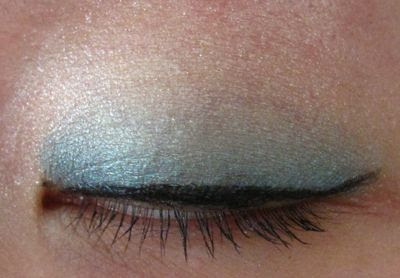 Do check out my buddy, Kathi's detailed review and swatches of the Perfect Automatic Liner on her blog, Lotus Palace! The Lunasol website has been updated with the new fall/winter '09 base makeup collection which introduces a new Under Eye Base and Eye Essence Kit. The model is wearing Star Shower Eyes #2 Medium Night in the promo visual. The complete list of products used on her can be viewed here. 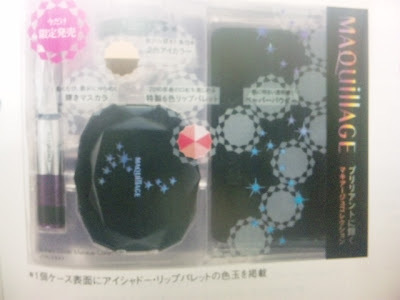 Here's a pic of the Maquillage Christmas coffret from 2Channel. It includes a glitter mascara, oil blotting paper and a mini powder eyeshadow duo and lip palette. This will retail for about 4000yen. 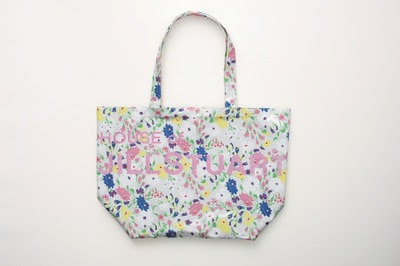 The November issue of CanCam will come with this House of Jill Stuart big tote bag. The magazine will be out on 23 Sep in Japan so Kino should have it in stock next Wednesday. Kino usually brings in a large quantity of CanCam so it should not be that difficult to snag a copy. House of Jill Stuart refers to the stores in Tokyo, Kyoto and Hiroshima which carry the Jill Stuart, Jill Stuart New York and Jill by Jill Stuart lines. In Tokyo, the store just opened earlier this month at Lumine department store in Kitasenju.